Family TaeKwon-Do | A positive martial arts community. We train in the Korean art of Taekwon-Do, a dynamic martial art that uses many different hand and foot techniques such as kicks, punches, blocks and strikes as a means of self-defence for exercise and sport. At Family TaeKwon-Do you are motivated and encouraged, but never pressured. Our classes are designed following a well-structured program, while still allowing for you to advance at a pace that is comfortable to you. As a member of Family TaeKwon-Do, you will work with your instructor to set out specific goals and work together to reach them. The Family TaeKwon-Do school is an energetic, positive atmosphere where you have fun while benefiting in so many ways – flexibility, cardio, physical strengths, self-discipline, increased communication skills and self confidence. Try a couple classes for free and see why joining us at Family TaeKwon-Do can be the right choice for you. We will never ask you to sign a contract, and all dues can be paid monthly. 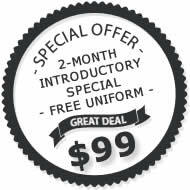 Our Introductory Special is always just $99.00 for your first two months and it includes a uniform! Try a class for free and see why joining us at Family TaeKwon-Do can be the right choice for you.